In the three hundred years since the events of the Mistborn trilogy, science and technology have marched on. Scadrial is now on the verge of modernity, with railroads, electric lighting, and even the first steel-framed skyscrapers racing for the clouds. Yet even with these advances, the magics of Allomancy and Feruchemy continue to play a role in this reborn world. Out in the frontier lands known as the Roughs, they are crucial tools for those attempting to establish order and justice. One is Waxillium Ladrian, a rare Twinborn who can Push on metals with his Allomancy and use Feruchemy to become lighter or heavier at wi ll. After twenty years in the Roughs, Wax must now put away his guns and assume the duties incumbent upon the head of a noble house--until he learns the hard way that the mansions and elegant tree-lined streets of the city can be even more dangerous than the dusty plains of the Roughs. Given the fact that The Alloy of Law is set hundreds of years after the events of the original trilogy, it naturally features a lot of new elements. New characters yes, but also a new setting, new threats, new enemies...even new rules within the existing magical system - which means new power combinations! Without going into details of the previous and current magical systems (Those who've read the series know what's up, and I don't want to spoil anything those who haven't ), I was fascinated by the fact that true Mistborns no longer seem to exist, and that now Mistings can also readily have Feruchemy at their disposal. This seems to have come about with the rise of Harmony as a way of maintaining balance but it soon becomes clear that some individuals can still become nearly immortal with certain specific Allomantic and Feruchemical combinations. This new approach to the given magical system was an innovative twist and definitely kept things interesting! With the new characters, there is a lot to love. Waxillium or Wax is the main protagonist but there's also Wayne and eventually Marasi. I thoroughly enjoyed the lot of them, Wax with his enigmatic ways, mild paranoia, righteous motives and serious skills, Wayne with his disguises, wicked abilities and inherent humor, and finally Marasi with her charm, intellect and courage. All of them won me over in no time. It was completely engrossing to see how they all came together and interacted with one another, and of course, the best part was figuring out how their powers worked and complemented each other. The main threat that our heroes face was a mystery from the offset but as the villain started to reveal himself, I couldn't help but be amazed by what he could do. However, his motivations did feel a tad bit underwhelming, but I have a feeling that as the series progresses, the bigger picture will reveal itself in a more satisfying way. 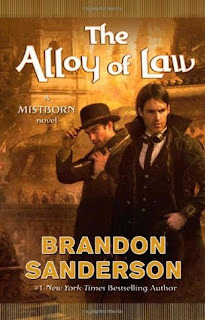 As far as the setting goes, The Alloy of Law has a Western/Steampunk style to it that is wholly new to the Mistborn Series. I was a big fan of how this new setting complemented the magical system and the characters at play here. Gunslinging, renegade law enforcement with the new combinations of Allomancy+Feruchemy work surprisingly well together and I can honestly say that I'm very eager to see how this new world will evolve from this point forward. Given that this story is set in the same world and that the magical powers are still at their basis the same as they've always been, I did find myself missing the usual world-building and magic-building that Sanderson does so well. I know that we didn't actually need it, but I couldn't help but want it all the same. Both the world and the magic simply grew from what they started out as, but I guess I could have done with more backstory on how things evolved the way they did, to make the story as immersive as the previous trilogy. With that being said, I still had a great time with The Alloy of Law. The new setting, fresh power combinations and engrossing characters were completely satisfying and worthy of the original trilogy. The ending pretty much left me begging for more so it won't be long until I sink my teeth into Shadows of Self! YES! Thanks Jaclyn^^ The new twist on the same magical system was a real treat, it felt like rediscovering the good stuff all over again :D The setting worked surprisingly well with everything else and yeah the characters were fantastic! OK, I promise you, PROMISE, that I will read Mistborn soon! :D I think The Alloy of Law was among the first books Goodreads recommended to me when I joined, and I was like, oooooh- this looks really, really good! I'm glad that I noticed that it wasn't the first book in the series, though, lol! Happy to hear that you enjoyed this, Micheline! Thanks Lexxie! :) I think you'd really enjoy the series and obviously, I'd be curious to chat about all the details with you as you made your way through ;) I hope you get to read them soon and thanks for stopping by!